After surviving four moves, an ownership change, and a couple decades of digital devices dominating the lives of youth. 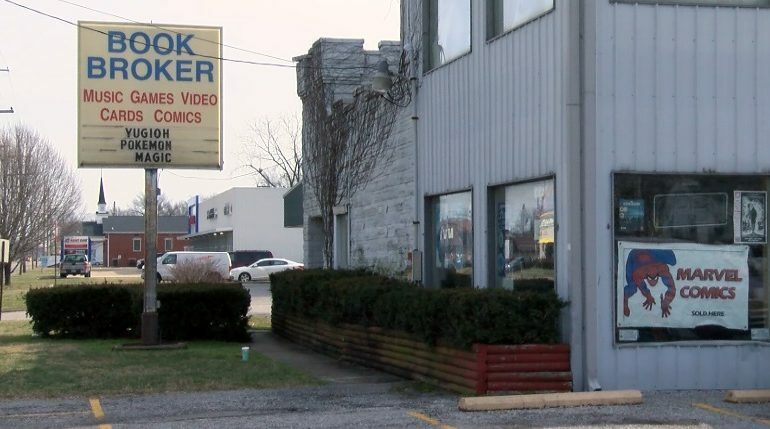 There’s one place in Evansville still giving books, games, and comics new life. And it’s the subject of this latest installment of Tri-State Treasures. If it’s collectible and made from paper, cardboard or plastic it’s probably on the shelf of one of the Tri-State most unique businesses: the Book Broker. Owner Tom Stillabower took over the business three years ago after Charles Redding opened the business in 1975. “The Book Broker first started in 1975 in a little building across from North High School. The first time I walked in there, I saw these rows of back issue comics, and I had never seen anything like that before,” says Stillabower. That growing collection would see the Book Broker relocate four times over the years and as the inventory grew Stillabower says the distance people traveled grew too. Even their commercial has a vintage feel informing customers of their brand-new location on Covert Avenue across from McDonald’s a location they have had since 1997. Stillabower says the Book Broker’s appeal and success stem from variety. “We don’t just concentrate on one item. We have such a variety of things,” says Stillabower. And events too from weekly clubs and games to taking part in an annual nationwide campaign called ‘Free Comic Book Day’ the first Saturday in May. This year the Book Broker turns the page on a 44th year in business making it a Tri-State treasure.